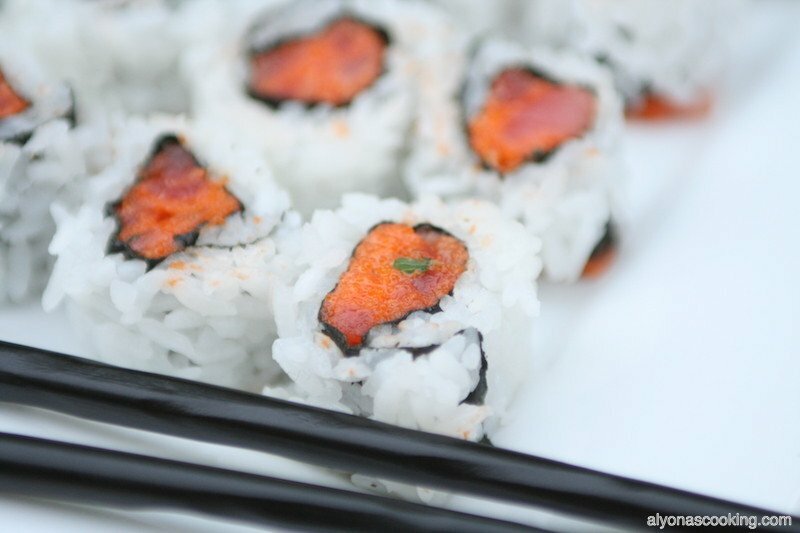 This is by far my favorite go-to Sushi Rice and Spicy Tuna Rolls recipe. 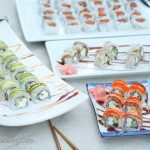 I have made this sushi recipe countless of times and love how close it is to the authentic Sushi rolls served at sushi bars. My sister has commented that I make the best sushi and I don’t even count myself to be an expert of any kind. Making sushi isn’t as complicated as you may think and it’s actually quite simple once you get the hang of it. I absolutely recommend a bowl of water near by at all times when handling the rice as sushi rice can get very sticky. And plastic food wrap works wonders, especially for slicing. This recipe makes 15 rolls, which goes pretty fast in our house….Literally this is usually gone by second day, we enjoy it that much! 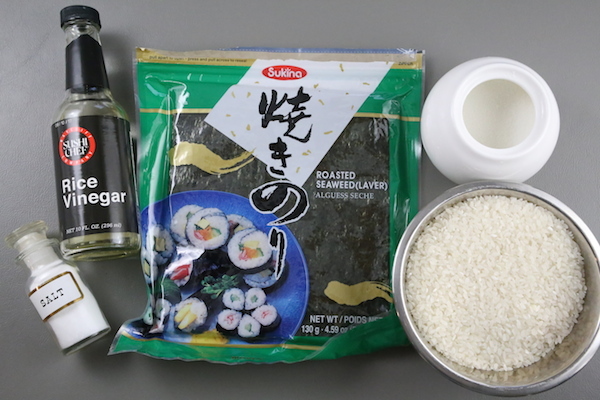 This is by far my go-to recipe when I make sushi, so you can be sure this comes out delicious. Helpful tips: Be sure to use plain rice vinegar, as some rice vinegars are already seasoned (meaning they already have the salt & sugar added to the vinegar in most cases.) Cool the rice before making your rolls. 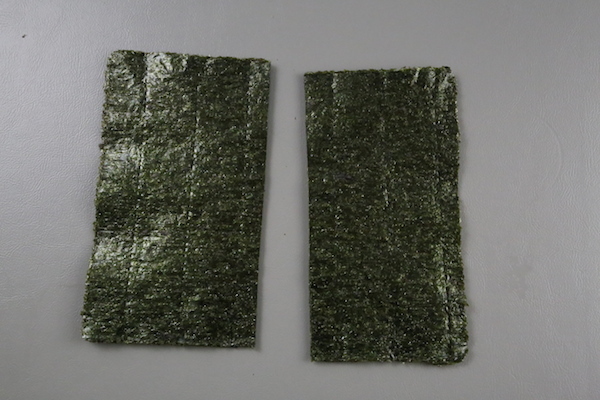 If you add warm rice to the seaweed (nori) sheets the results can be soggy and very chewy in a bad way. 2. Place rice into a saucepan and cover with 3 1/4 cups of cold water. 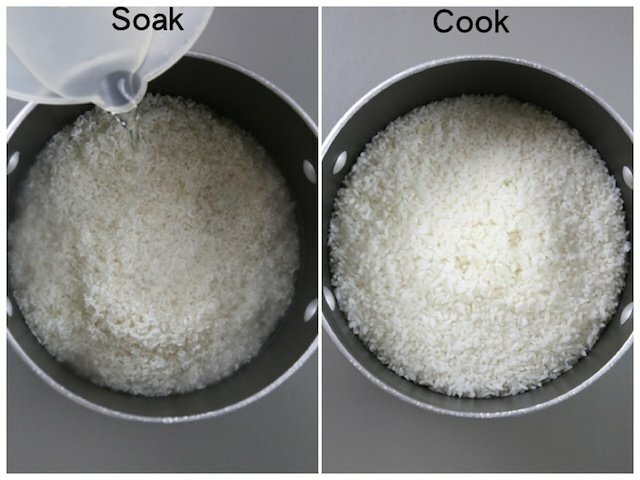 Allow rice to soak for 30 minutes. Then Bring rice to a boil; reduce heat to low and simmer for 15 minutes. Turn rice off and let it steam for another 15 minutes. 3. In a small saucepan whisk together the vinegar, sugar and salt until mixture dissolves. Cool slightly. 4. 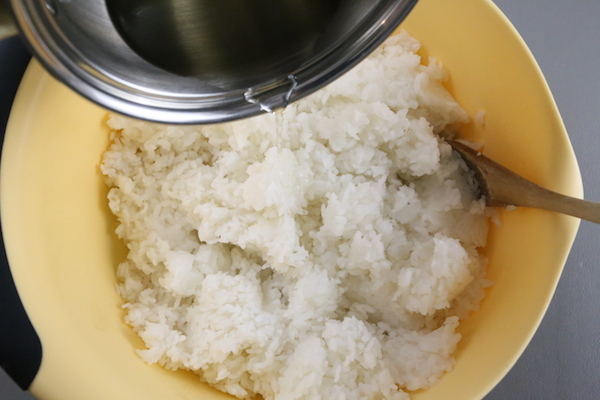 Transfer cooked rice into a large bowl (preferably a non-metallic bowl) and pour the vinegar mixture over the warm rice; gently stir with a wooden spoon then cover and set aside to cool. 5. 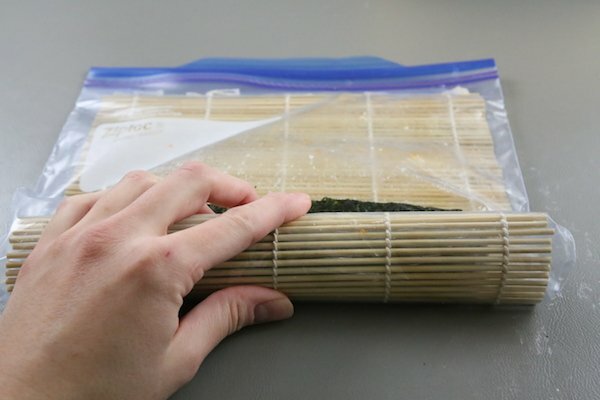 Be sure to cut nori-sheets in half to create a perfect sized roll. 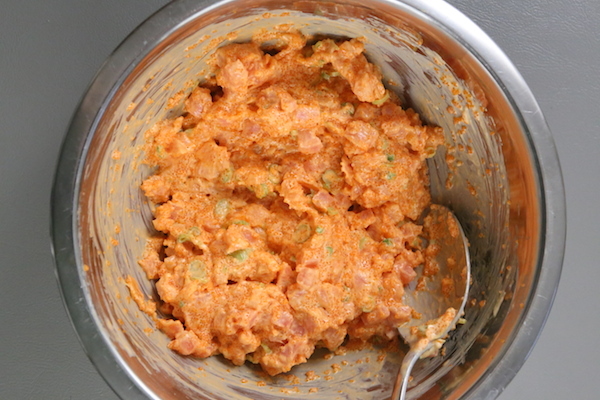 TO MAKE SPICY TUNA: Combine all the ingredients. 6. Place a big handful (about 1/2 cup full) onto 1/2 sheet of nori. Using wet finger tips spread out the rice evenly over the entire surface. 7. 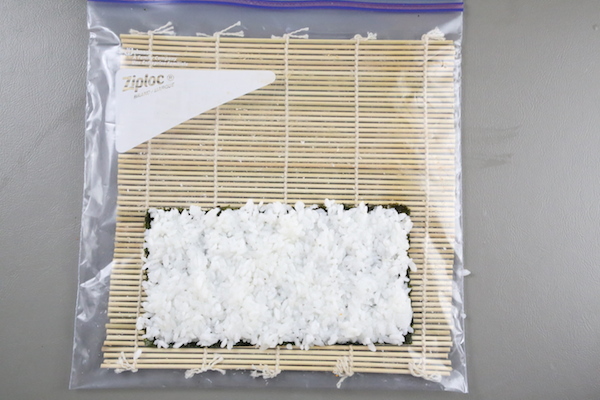 Flip nori sheet over with the rice side facing down and place desired filling onto the lower half of the nori sheet; roll tightly using a sushi mat. 8. 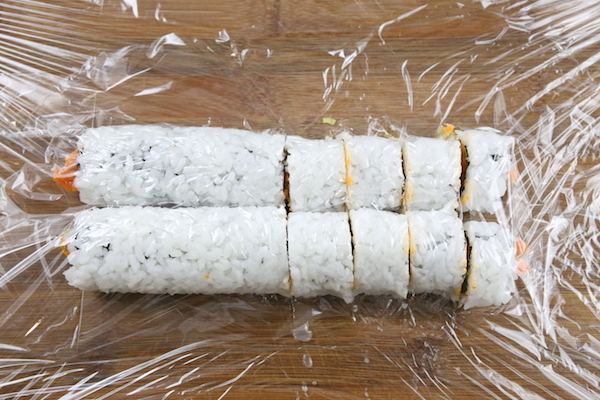 Place plastic wrap over a pair of rolled sushi and slice in half. Then slice each half into 4 equal pieces. Place rice into a saucepan and cover with 3 1/4 cups of cold water. Allow rice to soak for 30 minutes. Then Bring rice to a boil; reduce heat to low and simmer for 15 minutes. Turn rice off and let it steam for another 15 minutes. 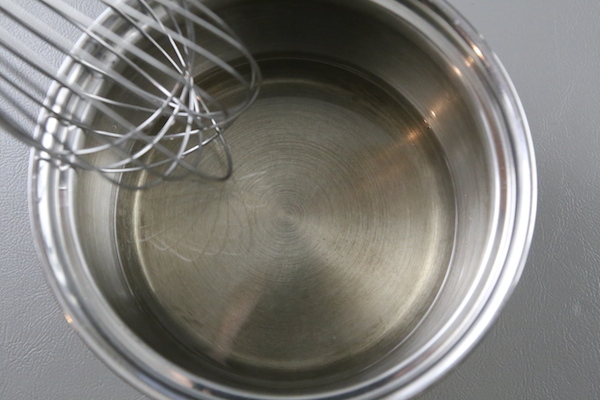 In a small saucepan whisk together the vinegar, sugar and salt until mixture dissolves. Cool slightly. Transfer cooked rice into a large bowl (preferably a non-metallic bowl) and pour the vinegar mixture over the warm rice; gently stir with a wooden spoon then cover and set aside to cool. 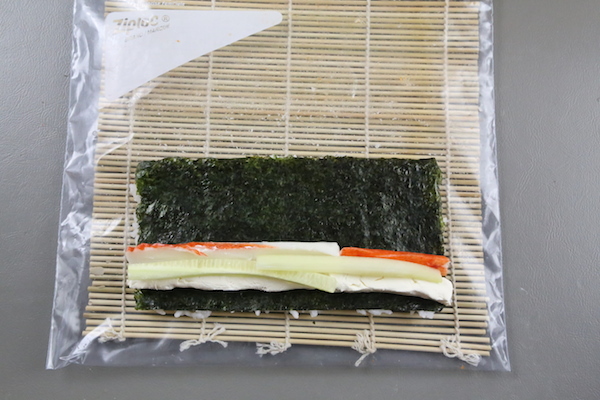 TO ROLL SUSHI: Be sure to cut nori-sheets in half to create a perfect sized roll. Place a big handful (about 1/2 cup full) onto 1/2 sheet of nori. 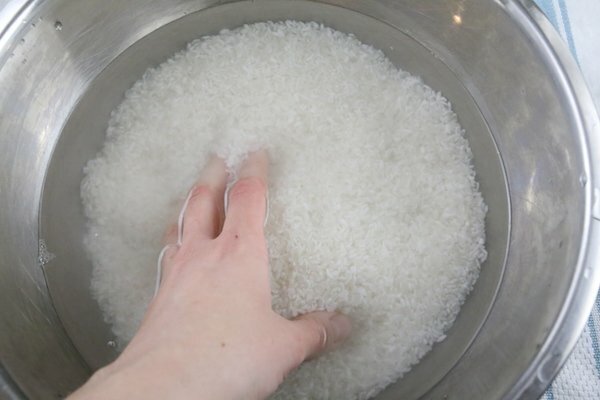 Using wet finger tips spread out the rice evenly over the entire surface. Flip nori sheet over with the rice side facing down and place desired filling onto the lower half of the nori sheet; roll tightly using a sushi mat. 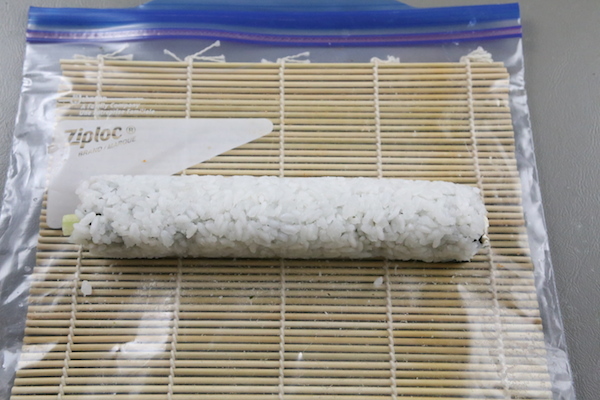 Place plastic wrap over a pair of rolled sushi and slice in half. Then slice each half into 4 equal pieces. TO MAKE SPICY MAYONNAISE: Whisk together the mayo and sriracha sauce until smooth.